Colonel Brandon. He wasn't the most dashing suitor a girl ever laid eyes on but he was the most loyal, kind, and gentle, not to mention deeply romantic, one. I remember seeing Sense and Sensibility for the first time as a young girl and was deeply moved by the love he had for Marianne. He was always there. He never once left her side. Out of all of Jane Austen's leading men I do believe he will always be known as the most loyal. 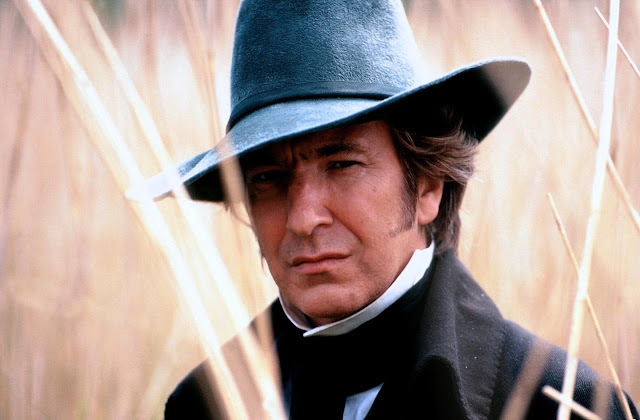 The world lost a great actor today, and for all of us Austen fans it felt as if we lost Colonel Brandon as well. Alan Rickman will be remembered for many great roles but this one is definitely my favorite. This scene always gets me. After Marianne has her heart shattered to pieces, Brandon swoops in to rescue her from the pouring rain and cold, sends for her mother and sister when she becomes deathly ill, and eventually woos her by readings of William Shakespeare. I've attached a clip of Alan Rickman reading Sonnet 130. Farewell, Mr. Rickman. Ooh...that that scene gets me every time too! One of my favorite movies. Lovely tribute! Thank you so much, dear! One of my absolute favorite films for sure. Touches me every time I watch it!